Pioneers in the industry, we offer dunnage bags from India. 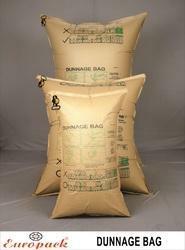 Dunnage bags are specifically designed to secure and stabilize cargo in containers, closed rail cars, trucks and ships. They prevent both lateral and longitudinal movement and are much more effective in stabilizing cargo compared with wood blocking and bracing.